When the weather gets warm, I’m all about cooking where I don’t heat up the kitchen. I don’t use my slow cooker(s) as often as I should so I’m always on the look-out for yummy recipes. I haven’t tried this one but I will one of these days. Total Time: 3 hr. 30 min. 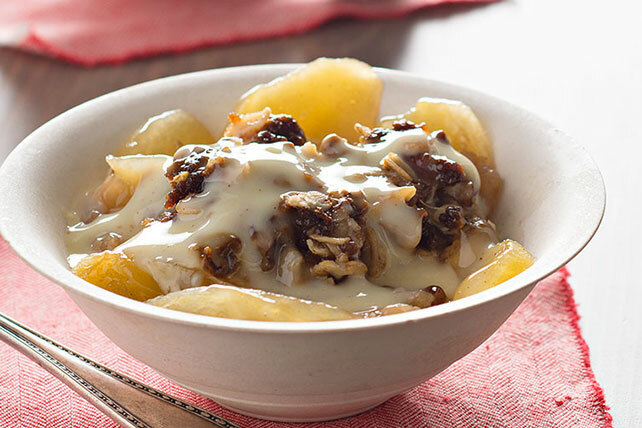 This slow-cooker apple crisp with its oaty ginger-nut topping is quite luscious on its own. But it’s even luscious-er with warm custard! Combine sugar, flour and cinnamon in large bowl. Add apples; mix lightly. Place in slow cooker sprayed with cooking spray. Mix gingersnap crumbs, oats, nuts and butter until blended; sprinkle over apple mixture. Cover with lid. Cook on LOW 3 to 5 hours (or on HIGH 2 to 2-1/2 hours). Beat pudding mix, nutmeg and milk in microwaveable bowl with whisk 2 min. Microwave on HIGH 2 min., stirring after each minute. Spoon over individual servings of dessert. This entry was posted in Writing Life and tagged characters, family, food, fun stuff, recipe, Red Dirt Royalty, Tuesday Treats. Bookmark the permalink. I suspect the skin on the pre-cut apple slices would get rubbery. I vaguely remember trying to get lazy with some apple dessert years ago by not peeling and the skin was nasty. But maybe that was just me. I do love me some apple crisp, and like you I hate using the oven in the summertime, so maybe I’ll give this a whirl down the road a piece. It looks super yummy.